Based on reviews from 8,122 users. Learn how our rankings work or see our guide to Adidas Stan Smith sneakers. Updated Apr 2019. 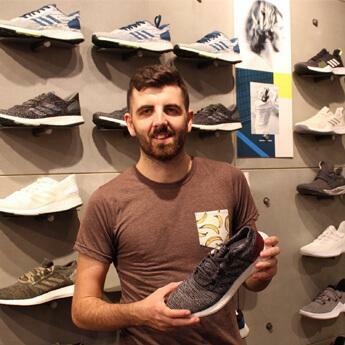 As one of the sneaker brands which dominate the industry, it is unsurprising that Adidas has produced some of the most iconic and most popular models. After all, the brand wouldn't reach its current success if the pieces it produced are forgettable. Peering at its history, Adidas has released great designs, ranging from low-top to high-top shoes, delving into performance and athletic footwear, and utilizing different colorways possible. Among its favorite releases, or as a more accurate term, the most popular version from the brand, is the Adidas Stan Smith sneakers. Its ubiquity came as a surprise to many. Comparing the Adidas Stan Smith sneakers to other tennis-inspired shoes, its design does not seem to fall far from the tree. Like most of the standard tennis shoes, it sports a white leather upper and rubber outsoles. What sets these apart from the others, albeit done in a very minimal manner, is its signature green speckles on the heel and tongue and the stamp of the namesake's face. Keeping consistent on the simplicity of the design, the brand's signature Three Stripes are traded off with three lines of perforations. During the release of the Adidas Stan Smith sneakers, many paid attention to its uniqueness because it is the first leather tennis shoe ever made. This material stands out from the sea of canvas-clad footwear that reigns the market. More than the given oomph on its design, leather adds to its durability to its construction. The 60s and the 70s holds a sweet spot for tennis. Because of this, it is only understandable that brands like Adidas, who are consistently on top of their game, capitalize on this. The famed sneaker that we now know was designed by Horst Dassler, son of founder Adi Dassler in 1963. Not a lot knows this, but the sneaker was named Robert Haillet first, after a French professional tennis player. During the time of launch of the shoe, the athlete retired, making it nonsense to release a shoe named after him. Adidas found the successor in Stan Smith, one of the most exceptional athletes. Since then, his name and face became attached to the shoe, and the rest is history. Even though its popularity was sustained much longer than expected, Adidas had to stop its production in 2011. Unexpectedly, the shoe was experiencing an overall decline in sales. Despite many disappointed fans, most of which expressed it on social media platforms, the decision was made. Come 2014, just when fans and sneakerheads expected that Adidas Stan Smith sneakers could only be found on underground platforms, the brand made one of the best moves in the sneaker world. The time couldn't be more advantageous as it marks the shoes' 50th anniversary. Matching it with new and improved materials and the right marketing strategies, the Adidas Stan Smith sneakers returned. The brand used the power of the social media to post campaigns and advertisements, strategic to reach the younger market who are not aware of the shoes' rich history and the man behind the shoe. They also collaborated with artists and retailers and produced limited edition kicks to increase the buzz and keep the market excited. Indeed, the Stan Smiths prove that absence makes the heart grow fonder. The style of the Adidas Stan Smiths is versatile. Since the sneaker was initially made for tennis, the style fits the seemingly snobby and exclusive tennis club fashion. Its pristine white leather upper and low-top construction translates significantly on its style flexibility and how it can be worn from court to streets. Transforming as a lifestyle sneaker, there is no need for the Adidas Stan Smith sneakers to have a style muse because it magically transforms and pairs well with any outfit, a sneaker chameleon if you must say. Celebrities played a massive role in its resurgence and popularity. The return of the Adidas Stan Smith sneakers only made the already great sneaker, more exceptional. Seeing them being worn by music, runway, and fashion icons, made such a significant impact on its popularity and return of sales. One of the most notable Stan Smith appearances was made by Phoebe Philo when she took a bow on the Celine runway wearing the famous white sneaker. It not only made the ordinary sneaker high fashion but it also sparked the return of the Adidas Stan Smith sneakers. Other well-known stars spotted wearing these were Kanye West and Pharell, who eventually partnered with the brand for his rendition of the Stan Smiths. One can easily justify that it is value for money. If the value for money can be put into a formula, the amount of wear should be factored in along with the amount of the product. If this is the case for the Adidas Stan Smith sneakers, then many consumers can attest its worth. The OG Stan Smiths are usually priced at $75, a reasonably affordable price to pay for a timeless, durable, and versatile footwear. The rise of the athleisure trend also gave rise to its popularity. The Adidas Stan Smith sneakers came out as performance footwear but found greater success in the lifestyle arena, thanks to the athleisure trend. Even before the term was conceived, the shoe was prevalently worn in the casual scene. The sporty casual trend only made the already favorite sneaker omnipresent. There's a Stan Smith pair for everyone. The popularity and ubiquity of the Adidas Stan Smith sneakers may come as an advantage and disadvantage. While some are ready to jump into the tennis sneaker trend, some are not fans of wearing a piece that can be seen everywhere. With the many versions released by the Adidas Stan Smith sneakers, one, whether jumping on the trend or not, can find one that suits their liking. Its history proves that its design is timeless. Before the spurt of the minimalist sneaker trend, the Adidas Stan Smith sneakers have already it, intentionally or accidentally. For more than 40 years of existence, it shows that people from different generations, whether familiar with the man behind the shoe, can appreciate these. One of the most attention-grabbing features of these sneakers is the use of rich hues. The DNA of the sneaker, like the low-top silhouette and the design on the tongue, is retained. Unlike the OG Stan Smith, the Adicolor does not have perforations on the side. The Stan Smith Leather Sock is a deconstructed version which comes in a monochromatic colorway giving it a more minimalist appeal. It has a futuristic interpretation with the use of a one-piece soft Nubuck upper matched with unfinished edges. The heel and tongue are also constructed with the same material as the upper. The Stan Smith PK makes the old silhouette meet modern tech. The iconic favorite is clad in a Primeknit upper, making it more comfortable because of its adaptive fit. This material is more flexible and more lightweight compared to the most broken in leather upper. The Boost is the brand's most responsive cushioning system. The sole gives an exciting accent by providing texture to the overall look of the shoe. Most of the elements of the shoe—the stark white upper, the green heel logo, and the tongue label, are kept intact. The Stan Smith CF, as an alternative to the traditional lace-up closure, sports three Velcro straps. Aside from giving the sneaker a unique look, the Velcro straps provide convenience to its users. Users can undoubtedly feel luxurious wearing these because of its all-leather upper, tongue, and lining. The opulent material is matched with the highest-quality craftsmanship and stitching. The Stan Smith Recon is accentuated with some gold details on the sneakers' tongue. The gold detailing for the branding on the tongue of this sneaker adds more appeal to the shoe and offers a vintage finish. All this time, fans are used to the idea that the Adidas Stan Smith sneakers come only in a low-top profile. This model though confirms that the model is not defined solely for its construction. More so, it is also a living proof that the brand is able to push the model into different levels. The mid-top form of the Stan Smith enhances its support and comfort. Other Stan Smith details seen on the OG are retained, including the green heel and perforated sides. If the term match-made in heaven had to be epitomized, this sneaker had to be it. Who would've thought that a Stan Smith x Stan Smith is possible? American Dad and Adidas fans can surely have a lightbulb moment seeing this collaboration as both the cartoon character and the shoe model meshed perfectly with this sneaker. One may be deceived that this interpretation is the same as the original version as everything remained the same. The only difference is that American Dad Stan Smith houses the tongue. If the Adidas Stan Smith sneakers get injected by estrogen, it's going to be this version. The flair of a wedge merged with the look of the sneaker creates a distinct look. The mid-top construction gives additional support while retaining the casual sporty look that the Stan Smiths exude. It also gives the ladies the needed boost of height without compromising comfort. At first glance, these shoes don't exactly look like Stan Smiths because of its bold silhouette. The Y2K upgrade goes on the more maximalist route, making it look more like a performance sneaker than the now casual looking shoe. Comfort is not compromised feature with this pair as it is injected with EVA midsole. Stan Smith 80s Mid "Star Wars Imperial Guard"
Looking at the shoe will certainly make one regard, "Is this a Stan Smith?" Since this version looks far off from the original, it is only understandable. This sneaker was launched in collaboration with Star Wars. It dons a mid-top construction and an all-red colorway, reminiscent of the Imperial Guard. The character's badge is also displayed on the tongue. This skate-ready reiteration is in collaboration with retailer BAIT. The upper is composed of heat-pressed natural hemp with a stoned-out pattern all over. The hairy chunk suede used on the heel mimics the texture of cannabis buds. The heel tab and tongue, on the other hand, contains pharmacy prescription labels in reference to medical marijuana. It is titled "Cages & Coordinates," which represents two of the shoes included in the collection--the Stan Smith and NMD TS1 PK. The Stan Smith version comes in a black colorway with a premium leather upper and a contrasting white rubber outsole. Some of the elements added are the zippers on the side panels, black heel tabs, white texts on the side and tongue. The Porter x Adidas Stan Smith was in celebration of the former's 80th year of anniversary. The collection comes in two versatile colorways—black and blue. Both of which come in a leather and nubuck upper with Porter's signature orange accent. Staying consistent with the brand's signature, the tongue and vamp of the sneaker contained Tanker material and completed with a white rubber outsole. The tag on the tongue replaces Stan Smith's face with a Porter bell hop logo. Released in Fall 2017, Pharrell released this collection along with the Tennis Hu Icons Pack. Hu is the artist's line, which is the shortened version for "Human." The collection ensures that its wearer will stand out from the muted and dark fall environment because of its wide range of colorways. The colorways include Tactile Rose, Icey Blue, and Linen Green. These colorful hues sit atop a white rubber outsole. Know then when you're wearing a shoe that has a Pharrell, flair on it, you will surely stand out. These Stan Smith sneakers grab attention because of its vibrant patterns and colors. It is available in three colorways—blue, white, and yellow, all clad in red dots. These shoes are clad in an intricate vintage floral pattern in a mid-top Adidas Stan Smith sneakers. It has a woven Jacquard construction, and it comes in two colorways—Midnight Blue and Off-White Cream. Having his sub-line with the brand, Yohji Yamamoto is no stranger to Adidas. His influential and avant-garde designs capture the attention of both minimalist and maximalists who want to make a statement. True to style, the designer puts unexpected twists on the familiar silhouettes. In commemoration of the return of the Adidas Stan Smith sneakers, Y-3 released a collaborative piece. Although the blueprint of the shoe was used, Yamamoto injected much of his flair on the trainer. The upper of the shoe comes in a thick navy canvas material. The heel tab, toe box, and tongue come in smooth white leather. Instead of the perforated Three Stripes, the designer replaced it with hand-stitched zig-zag embroidery. The stitching is left deliberately unfinished as the threads are left hanging the midsole. The tongue of the shoe has an oversized Y's logo. Y's by Yohji Yamamoto "Diagonal"
The designer puts an avant-garde but subtle spin by making the laces and eyestay on a diagonal position. These are available in blue and white colorways. Both of which have brown overlays on the heel. Yamamoto injects Y-3 stamp on the iconic Adidas Stan Smith sneakers by using a heat-pressed construction on the two-piece upper, which results to a clean finish. To make its users wear it with or without laces, it has a zip-off eyestay. The shoes are infused with Poron technology, a dependable, flexible, and breathable cushioning for comfort and long-lasting performance. Instead of the Three Stripe perforations, it sports an "R" on the side panels. Raf Simons makes use of the original Stan Smith silhouette and the Comfort Badge. Stan Smith's face on the tongue gets replaced by Raf Simons face. One of the most sought-after brands in the industry today is Supreme. Its attention-grabbing releases and ingenuity make it one of the most coveted partners of different sneaker companies, including Adidas. The Supreme x Adidas Stan Smith sneakers are amongst the creation of Sydney Kay customs. It dons an all-black upper with a hand-painted "By Any Means Necessary" text on its side panels, as inspired by the recent Supreme x North Face collaboration. Sneakerheads will surely flock for a pair gave that this extremely limited-edition sneaks will only come in 10 pairs. Although Stan Smith's concern was more on the performance of the shoe rather than the aesthetics, he suggested using blue instead of green as it is a more popular color. Most of his career, Stan Smith was seen sporting the low-top Adidas Stan Smiths. However, now that he has retired, his go-to sneaker is the Adidas Stan Smith Millennium. The Adidas Stan Smith sneakers are the first leather tennis shoes. Despite looking older now, the face on the tongue remained the same throughout its history. Stan Smith suggested some of the details on the shoe— the addition of the tab on the tongue to keep the laces from sliding off and additional heel support. Once in a while, the athlete goes to stores to buy a pair and uses his own money to pay. The recorded collector who has the most number of Adidas Stan Smith sneakers is reported to have more than 200 pairs, more pairs that the Stan Smith himself. More than 30 million kicks were sold over the past four decades. Versatility is a word that is easily thrown, but when it comes to the Adidas Stan Smith, it points out to different perspectives. Aside from coming in unisex sizes, the style of the shoe is also fitting for both sexes. How do you clean and prolong the life of Adidas Stan Smith sneakers? Spot-cleaning can be done for small stains. A stain remover should do the trick. To thoroughly clean the shoe, a dish soap, warm water, a washcloth, and a toothbrush are the materials needed. Scrub the shoe gently. The toothbrush should take care of the nook and crannies. Pat the shoe dry with a towel and let it air dry after. A waterproof spray will also help extend its life. What is the controversy between Skechers and Adidas regarding Stan Smith? Because of how distinct the design elements of the Adidas Stan Smith sneakers are, it cannot be denied when another and copies it. Skechers Onix used similar aspects on the sneakers—the all-white upper, green heel logo, and perforations on the sides all seem too similar. Because of this, Adidas brought the case to the courts in 2015. In 2018, approximately two years after, the 9th U.S. Circuit Court of Appeals released a preliminary injunction, barring Skechers from marketing Skechers Onix because of its high similarity with the Adidas Stan Smith sneakers. Can the Adidas Stan Smith shoes still be used for tennis? Since its conception, the qualities and aesthetics of the Stan Smiths remained unchanged. The style may have kept up with the modern times, but sad to say, its features did not. Currently, there are much more suitable pairs in the market, those that are specifically created to handle all the running and smashing on the court. The Stan Smiths currently is categorized as a casual sneaker. Should I wear these shoes with or without socks? How one prefers the Adidas Stan Smith sneakers is really up to the user. Although socks can be used for a purpose or style, wearing these without socks are also possible. It should also be noted that because of the leather lining, some might experience issues with odor. Putting powder after every use can be one of the solutions in order to prevent this problem. What is the price range of Adidas Stan Smith shoes? The price of the Adidas Stan Smith Sneakers varies on the retailer and the model. 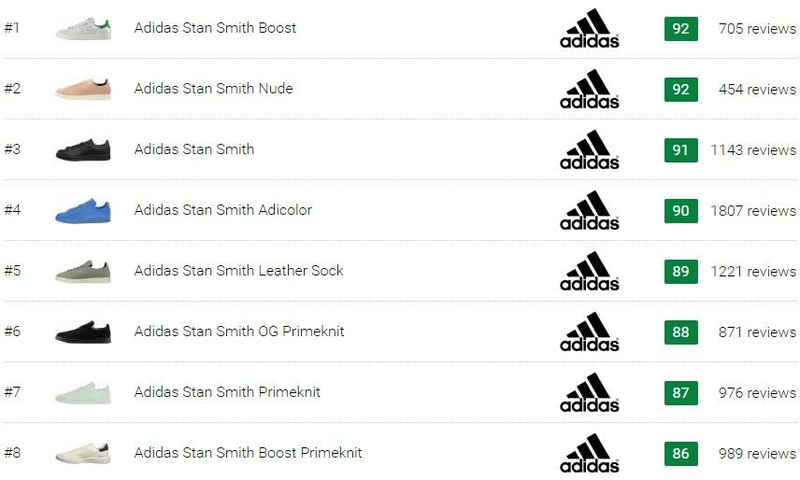 The Adidas website offers the Stan Smiths for $75. Those with different materials like those injected with Primeknit and Boost technologies garner a higher price point compared to the OG. Collaboration and limited-edition pieces usually run the priciest. How do you style Adidas Stan Smith sneakers? Styling these are always up to its wearer. However, those who are clueless can still take advantage of the minimalist silhouette of the sneaker. It makes almost anything pair well with the sneaker, from casual and formal wear. For casual wear, users can replicate the off-cam street style of Gigi Hadid, Taylor Swift, Kendall Jenner, Jamie Dornan, Kanye West, and David Beckham who are all often seen sporting the shoe. Those wanting to take it up a notch can also wear pair these with formal wear. Take cues from Martin King, Adidas' North America president who sported an all-white number and the Adidas Stan Smith sneakers. Do Stan Smiths fit true to size? The Adidas Stan Smith sneakers is a unisex sneaker, much like the other models under the Adidas Originals. On the brand's website, the sizes available run from 4.5-20. Women wanting to cop a pair can simply go 1.5 size down to get their ideal fit. Since most of the users feedback note that they are true to size, future Stan Smith purchasers shouldn't have a problem with its sizing. How can one detect real from fake Stan Smiths? For omnipresent footwear, it can be unavoidable that replica models seep through the market. Those who can't avail of a sneaker on the brand's site and other reputable footwear retailers can take a look at these tips to avoid getting ripped off. The price should serve as an indicator. Prices way below the Standard Retail Price should mean that it is fake. The packaging should show signs of authenticity. The original Adidas Stan Smith sneakers should come in a blue box which shows details like color, country of manufacture, the model in all caps, international sizes, and barcode. The tongue should also have Stan Smith's face, name (in uppercase letters), and signature. The branding of the shoe can be seen on the sides, with the Adidas text and trefoil logo, and the text Stan Smith in lowercase letters and the trefoil logo on the heel. Where can I buy Adidas Stan Smith casual sneakers? For a popular item, it shouldn't be difficult to find these in the brand and brick-and-mortar stores. For shoppers who want to make use of the convenience of shopping online, it is recommended to order from Adidas.com and other reputable footwear retailers to avoid getting counterfeit models.